Will TomTom's iPhone App Herald the End of One-Function Devices? We still don't know exactly when the TomTom for iPhone GPS application will be available. But, we may know how much it will cost: a U.K. online electronics store has apparently leaked the price of the upcoming app via a pre-order listing. According to pre-order pricing from HandTec, the TomTom for iPhone GPS app will cost £113.85 -- about $194. This price is for a kit that includes the satellite navigation software, and a special car kit for your iPhone that is used for docking, enhancing GPS signal and sound, charging, and hands-free calling. 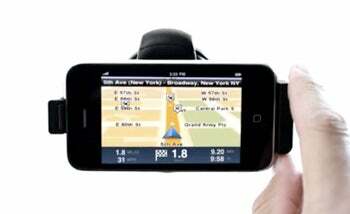 The TomTom for iPhone app was one of the prominent third-party products demonstrated during June's Apple WWDC keynote. At the time, TomTom said the product would launch this summer, and the company still says it's due "later this summer." If the $194 price for the TomTom iPhone app is accurate, it makes this smartphone navigation system a bit pricey. Even in comparison to similar turn-by-turn navigation apps in the App Store, TomTom's is more expensive. For example, Navigon's Mobile Navigator is priced at $70 (a sale price that lasts until August 15). But the Navigon product doesn't include a dock, which could account for the TomTom's ramped-up price. Still, you can get a standalone TomTom GPS unit for about $149 on Amazon. That means you'd have your own dedicated GPS device and your iPhone wouldn't have to do double duty (and the iPhone isn't very cheap either). It's like that TomTom will offer a software-only version of the package, as hinted at WWDC in June. I would assume that TomTom for iPhone without the car kit will cost around $100, putting some healthy competition on Navigon. And there are still a few unanswered questions about TomTom's iPhone app also. It is yet unclear how the maps update process will be done, how well the app will integrate with iPhone's limited multitasking abilities, and how users will download the 1GB app. More details should become available, though, as the application is approaching public release.